A helical pile is a deep foundation element consisting of a central steel shaft with single or multiple flights of helix bearing plates. The helices are installed into bearing soil layers capable of achieving the design torque. 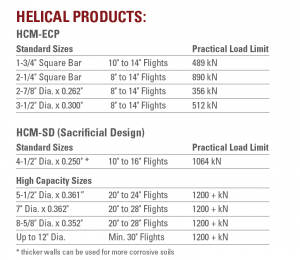 Helicals can be custom designed to meet specific project requirements by varying the number of flights and diameters of the bearing plates and adding extensions to reach design depths. Helicals are installed to design torque values based on empirical and theoretical design principles to achieve the required compression and tension load capacity. They are typically installed with the aid of torque measuring equipment to confirm the achieved torque or the torque is correlated with equipment pressures. 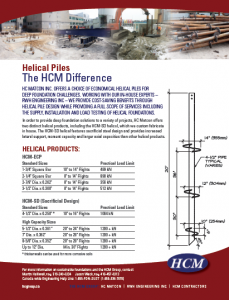 The HCM Group offers economical helical piles for deep foundation challenges. To provide competitive foundation solutions to a variety of projects, we custom fabricate our HCM-SD helical in-house. Working with RWH Engineering Inc. we provide cost-saving benefits through design input and offer a full scope of services including the design, supply, installation and load testing of helical foundations. The HCM-SD helical is based on a sacrificial steel design and provides increased lateral support, moment and axial capacities. The high strength pipe can withstand torque capacities of up to 30,000 ft-lbs to resist loads as high as 500kN in adequate bearing soils. Lower cost than driven or drilled piles – in some cases, shallower installation to reach same capacity as driven piles. HCM Group can be consulted during design phase to confirm that this solution will be practical and economic for the site specific soil conditions.